Tormas represent the awakened mind of the Buddha and it is taught that through one's connection with them, one's own Buddha mind can be awakened. Each torma's exact shape, proportion, and color arise from the wisdom minds of the Buddhas, therefore their sublime material form facilitates spiritual practice and accomplishment. Tormas are commonly used by tantric Buddhist practitioners, but they can be of benefit to anyone who wishes to bring the enlightened energy of the Buddhas into their environment. Tormas are not only believed to bring about spiritual wisdom, but to also attract other favorable conditions into one's life such as: increased wealth, success, improved health, and overall protection from harm. For these reasons both spiritual practioners as well as lay people have traditionally prized tormas. 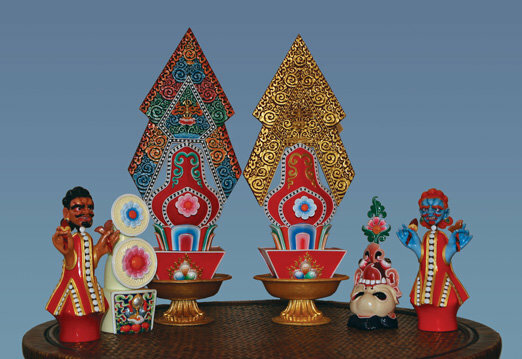 Rinchen Barwa offers fine hand-crafted tormas created under the auspices of Lama Tharchin Rinpoche. Lama Tharchin Rinpoche is the current tenth lineage holder of the largest Tibetan yogi sect, the Repkong Ngak-mang. He trained and gained experience in the ultimate great mysteries of the three inner tantras as well as the relative forms of training such as song, mandala design, dance, and sacred art. In Tibet, he served as the main shrine attendant (chöpön) in the protector temple at His Holiness Dudjom Rinpoche's residence for a period of seven years, when he was solely responsible for creating and attending to all the tormas regularly offered. 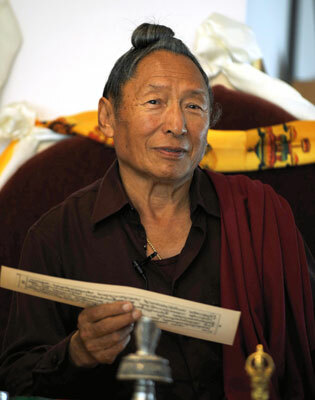 Lama Tharchin personally received definitive instructions in torma making from His Holiness Dudjom Rinpoche.